Over a billion individuals worldwide are considered overweight or obese. Bariatric laparoscopic surgery has been shown to lead to sustainable weight-loss with improvement in co-morbidities in these obese individuals. Robotic-assisted laparoscopic surgery is proposed as the next major evolution in minimally invasive surgery. In this study, we systematically review the literature regarding the feasibility and safety of robotic-assisted bariatric surgery in obese patients. A comprehensive search of electronic databases (e.g., MEDLINE, EMBASE, SCOPUS, DARE, BIOSIS Previews, Cochrane Library, EBM, Scopus, Dare, Clinical evidence, TRIP and HTA database) using broad search terms was completed. All case series and clinical trials assessing robotic-assisted bariatric surgery were included. All human studies not limited to English language reported from 2003 to April 2010 were included. Two independent reviewers assessed the studies for relevance and inclusion, and extracted data from the full versions of the manuscripts. Disagreements were resolved by re-extraction. Data was pooled for statistical analysis. After an initial screen of 297 titles, 77 abstracts were reviewed and 22 studies met the inclusion criteria and were assessed by full manuscript. A total of 22 studies were analyzed for a total of 1253 patients. The mean preoperative body mass index was 46.6 kg/m² (range: 41 to 52.8 kg/m²) based on 13 included studies. Major complications included anastomotic leak and or injury to intra-abdominal visceral organs. There were 8 anastomotic leaks from a total of 888 patients (anastomotic leak rate: 0.9%). Other serious post-operative complications included seven cases of bleeding out of 888 patients (bleeding rate: 0.79%) and strictures/stenosis in 13 patients out of 888 patients (stricture rate: 1.5%). 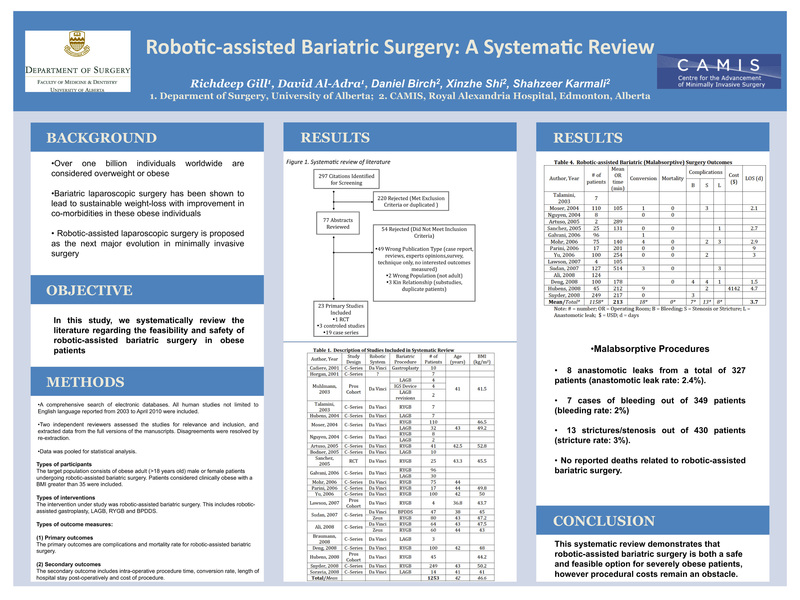 There were no reported deaths related to robotic-assisted bariatric surgery. This systematic review demonstrates that robotic-assisted bariatric surgery is both a safe and feasible option for severely obese patients.